With spring around the corner (and greening of pastures in South Dakota but rain still needed in western Nebraska), there are many questions from landowners and tenants concerning pastures leases. These questions generally concern leases that are already entered into and the pastures are not producing enough forage/feed. Landowners are concerned about further stressing pastures while tenants are concerned about finding feed and pasturing cattle for the spring and summer. What can be done from a legal perspective in this situation? Well, legally speaking, the pasture lease is a contract. This means landowners and tenants have agreed to certain obligations (e.g. providing pasture for rent). If there are no provisions in the lease regarding natural conditions such as drought and the obligations of the landowner and tenant in such a situation, it is difficult to revise or amend the lease. However, communication is key. Communication between landowners and tenants means that each discuss their concerns with each other prior to an emergency situation. This means each party has to be open to the concerns of the other. Open communication can lead to proactive solutions and cooperation. In the past, NRCS has provided information and assistance to those ranchers suffering due to the drought. Feel free to contact your local NRCS office to determine if any information and/or assistance is available. When it comes time to negotiate your leases, it is highly advisable to include provisions for natural conditions, such as drought, fire, or flooding. Because each ranching operation and lease is different, each requires individual considerations. As such, Legal Aid of Nebraska is happy to help. Feel free to contact us with any questions or request for assistance you may have! Another Friday, another Facts, Fun and Food! The University of Nebraska – Lincoln’s Drought Monitor showing some improvement in Nebraska and South Dakota. The Small Business Administration is making disaster loans available to all Nebraska counties except Richardson County for economic losses due to reduced revenues caused by drought conditions. More information is here. NRCS has introduced a web-based tool to measure water quality of water flowing off fields called the Water Quality Index for Agricultural Runoff. Nebraska’s AG Sack Lunch program for fourth graders visiting the Capitol is a success. Finally, because I love dill pickles, oven “fried” dill pickles with herb buttermilk ranch dressing. I’m sure you have heard about the Farm Service Agency’s new microloan program but nonetheless, since a few months have passed since the announcement, now may be a good time for a reminder about the program. As background, FSA devotes a percentage of its resources to assisting beginning and socially disadvantaged farmers. As a result, the microloan program may be one in which beginning farmers are interested for the reasons detailed below and the FSA will be able to assist. As you may or may not know, the FSA can now provide “microloans”, which were developed to for beginning, small, and niche farming operations. The loans are for up to $35,000 payable over seven years. While the microloan program requires farm management experience, the requirement is flexible. This can be met by prior farming experience, apprenticeship, or past participation in organizations such as 4-H, Future Farmers of America, beginning farmer programs, and community-based organizations. Further, small business experience along with a self-directed apprenticeship can allow a person to start farming with a microloan. What may the loans be used for? Examples include initial start-up expenses, direct marketing to restaurants and grocery stores, organic production, farmers markets and/or community supported agriculture, purchase of breeding livestock, delivery vehicles, annual expenses such as feed, fertilizer, and/or land rent, and minor farm improvements. Importantly, microloans may also be used for family living expenses. These are only examples, however; other expenses and needs may also be funded through microloans. The microloans provide a bridge between the FSA Youth Loans and more traditional loans for larger-scale production. As a result, the paperwork and application process is streamlined and simplified for a microloan than traditional operating loan from the FSA. Most importantly, an itemized cash flow budget are not required for the microloan. What is the catch? Frankly, I cannot think of any. For small and beginning farmers, the microloan program is an opportunity to finance your operation in a small, managed way. The FSA’s FactSheet is here and provides guidance. Go here to locate your local FSA office or here to access the microloan forms. As always, if you have any questions or need assistance, feel free to contact Legal Aid of Nebraska online or at 866-660-1391. The USDA designated 89 Nebraska counties as primary natural disaster areas due to the drought. Further, surrounding contiguous counties are also eligible to receive assistance. This includes counties in South Dakota, Wyoming, Kansas, Colorado, and Missouri. Due to the natural disaster designation, farmers and ranchers are eligible for emergency loans from the Farm Service Agency if eligibility requirements are met. Farmers and ranchers have eight months from the time of the natural disaster declaration to apply for loans. Due to the drought in Nebraska, the USDA announced an opportunity to graze or hay cover crops without endangering 2013 corn, soybeans, or grain sorghum crop insurance. Governor Dave Heineman details why the drought may continue and steps undertaken by the State of Nebraska. Funds are available in South Dakota for specialty crop projects. From the 10/11 Weather Team. 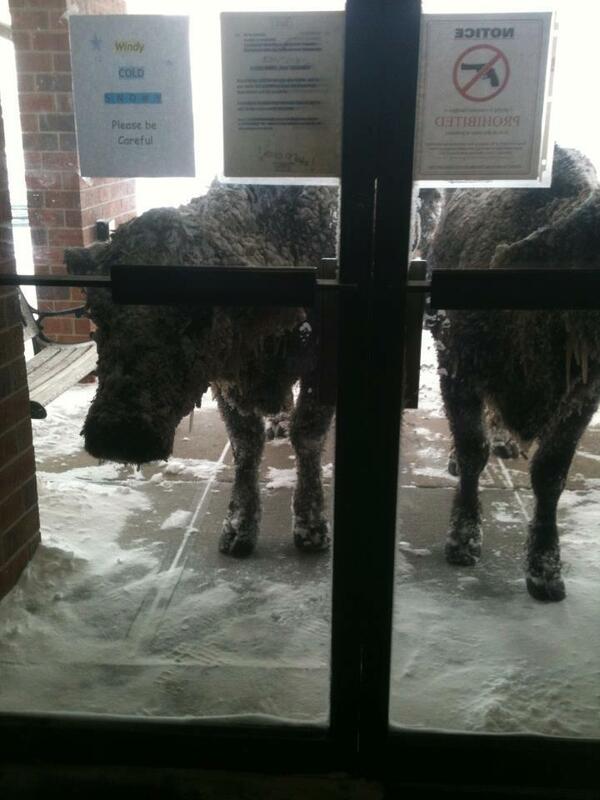 The 10/11 Weather Team has compiled pictures of the snow storm to hit western Nebraska, including some memorable pictures of cows in Alliance. The picture to the left may be my favorite. Finally, one of my favorites — caramelized shallots. They are wonderful with pork chops. Unlike Nebraska, South Dakota does not have a tax credit program. South Dakota does have, however, a bond program to assist beginning farmers known as the South Dakota Beginning Farmer Bond Program (SDBFBP). The SDBFBP is a tax-exempt bond program to assist beginning farmers in South Dakota purchase agricultural property at lower interest rates. Part 1 will cover the qualifications and eligibility for SDBFBP; Part 2, which is forthcoming, will cover nuances in the program that beginning farmers should be aware of. Agricultural land, agricultural improvements, and depreciable agricultural property shall only be used for farming by the individual, the individual’s spouse, the individual’s minor children, or any of them. Obviously, there are a lot of words in the above list which may have legal definitions. What are they and what do they mean? Agricultural land is land suitable for farming and which is or will be operated as a farm. Agricultural improvements are any improvements, buildings, structures, or fixture suitable for use in farming which are located on agricultural land. Under South Dakota law, a single family dwelling/residence located on agricultural land which is or will be occupied by the beginning farmer and structures attached to or incidental to the use of the dwelling (e.g. a garage) are agricultural improvements. Beginning farmer is an individual with a low to moderate net worth (here, under $400,000) who engages in farming or ranching or wishes to engage in farming or ranching. Depreciable agricultural property is personal property suitable for use in farming for which an income tax deduction for depreciation is allowable in computing federal income tax. Farm is a farming enterprise which is recognized in the community as a farm rather than a rural residence. Farming is cultivation of land for production of agricultural crops, raising of poultry, production of eggs, production of milk, production of fruit and other horticultural crops, grazing, production of livestock, aquaculture, hydroponics, production of forest products, and other activities as designated. First time farmer is a person who has never had any direct or indirect ownership interest in substantial farmland (defined below) in the operation of which he or she has materially participated. An ownership interest or material participation by a person’s spouse or minor child is attributed to the person as well. Net worth is total assets minus total liabilities as determined in accordance with generally accepted accounting principles. Assets are valued at fair market value. Substantial farmland is any parcel of land unless the parcel is smaller than 30% of the median size of a farm in the county where the parcel is located. The above is a multitude of words and definitions, but what does it mean in pragmatic terms? Well, it means that the SDBFBP permits lenders, individuals, partnerships, corporations, and other entities (“Bond Purchasers”) to receive federally tax-exempt interest with respect to a loan or contract sale made to a beginning farmer. Simply, after the Bond Purchaser arranges for a loan or sales contract, the Bond Purchaser will obtain from the South Dakota Value Added Finance Authority a federally tax-exempt Private Activity Bond in the amount of the loan or unpaid balance. The loan and its collateral are assigned to the Bond Purchaser as security for the bond. A sale to a beginning farmer by a close relative, defined as parents, grandparents, or siblings, is permitted as long as the purchase price paid by the beginning farmer is at fair market value. Further, a sales contract is not permitted; a loan from a third party must be used. Part 2 will go more in-depth; be on the lookout for it later this week. More information about the SDBFBP can be found here. If you have any questions, please feel free to contact Legal Aid of Nebraska at 855-660-1391. Every Friday, we provide a few items that may be of interest, both factually and fun, as well as a seasonal recipe. Hope you enjoy! The USDA extended the deadline for the voluntary claims process for Hispanic and Women Farmers and Ranchers who allege past discrimination by the USDA. The deadline is now May 1, 2013. The University of Nebraska – Lincoln’s Cornhusker Economics details preliminary results from the 2013 Nebraska Farm Real Estate Market Developments Survey. Unsurprisingly, land values and cash rent rates continue to rise. Custer County, Nebraska named as one of the best places to live by American Cowboy magazine. Finally, also from American Cowboy magazine, pan-fried mango chicken.